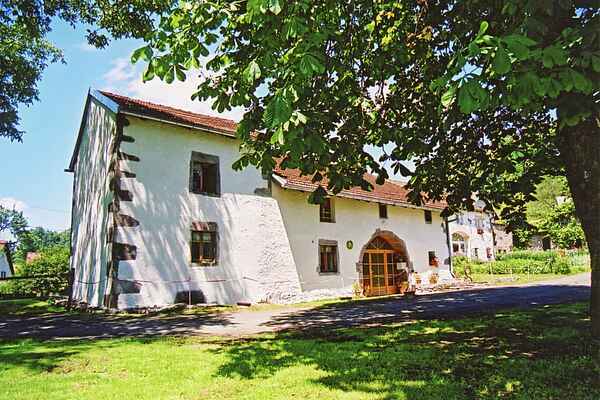 Your holiday home is a completely renovated former farmhouse. A small and peaceful haven just a few kilometres outside of Esmoulières. In front of the house is a stone seat under a large, shady tree; perfect for enjoying the view out across the stunning landscape. Enjoy the peace and quiet here, as you nibble on a baguette and sample the wine; both of which can be found at the local grocer in Faucogney (7 km). You are right in the middle of the Plateau des 'Mille Etangs': the region of the 1000 lakes. And right in the middle of the Parc Régional des Ballons des Vosges, the area of the round mountain tope ('balloons'). Don't forget to bring your walking shoes, mountain bikes, bathing suit or rubber dinghy! Beautiful 'green' autoroutes lead you through this stunning nature area. At the edge of this, 22 km away, is Luxeuil-les-Bains, a famous spa town famous for its red stone. Water sport lovers will be right at home in the village of Champagney (30 km), with the recreational lake that's ideal for swimming, sailing or surfing. There is a golf course in Genevrey (35 km).